Olive oil and vinegar may come in some of the more attractive packaging that inhabit our supermarket shelves, but that doesn’t mean it can’t be improved upon by eliminating it all together (after it gets home from the store, that is). If scooping handfuls of olive oil from a baggie isn’t your thing, you’re gonna need a serving device to store your salad dressings in. The Vintage Chic Vinegar and Oil Dispenser w/ Pour Spouts & Metal Stand makes for an impressive display that would look great on any countertop. 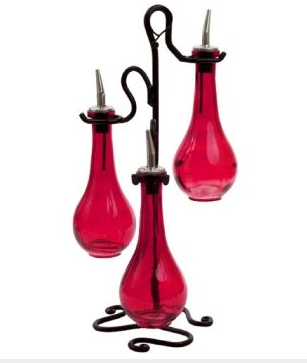 The functional centerpiece features three large bulbous containers, each of which can be filled with liquid. 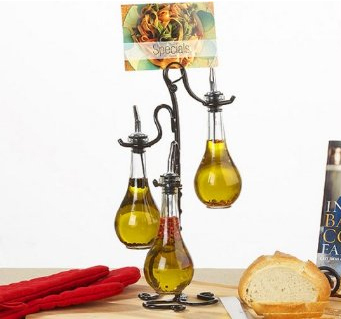 Useful as a soy sauce, olive oil and vinegar serving stand, the decorative display would make a perfect gift at under 30 bucks. Also available in red.